Project Description: To those living in the Northwest, Seattle gains its unique character by being a community of small cities, towns and neighborhoods. This collective exists as an aggregate of idiosyncratic neighborhoods without ever losing its Seattle-ness. 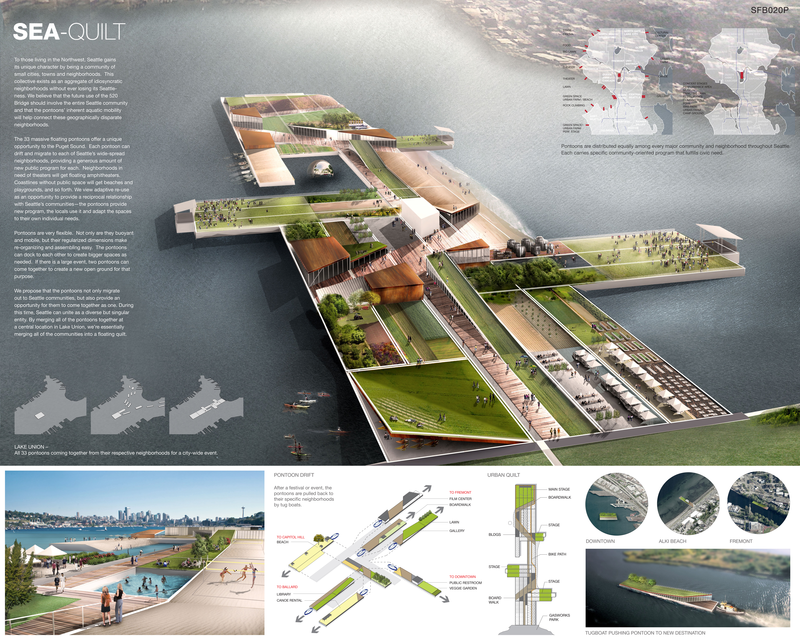 This project examines questions of character, program, mobility and history in the reuse of the decommissioned 520 Floating Bridge as part of the Rethink Reuse 2012 International Ideas Design Competition. The 520 floating bridge will be decommissioned in 2014 due to high maintenance costs, damage, and the need for expanded vehicular capacity. We believe that not only should the bridge structure be reused, but that the future use of the 520 Bridge should involve the entire Seattle community and that the pontoons’ inherent aquatic mobility will help connect these geographically disparate neighborhoods. The 33 massive floating pontoons offer a unique opportunity to the Puget Sound. Each pontoon can drift and migrate to each of Seattle’s widespread neighborhoods, providing a generous amount of new public program for each. Neighborhoods in need of theaters will get floating amphitheaters. Coastlines without public space will get beaches and playgrounds, and so forth. We view adaptive re-use as an opportunity to provide a reciprocal relationship with Seattle’s communities—the pontoons provide new program, the locals use it and adapt the spaces to their own individual needs. Pontoons are very flexible. Not only are they buoyant and mobile, but their regularized dimensions make re-organizing and assembling easy. The pontoons can dock to each other to create bigger spaces as needed. If there is a large event, two pontoons can come together to create a new open ground for that purpose. We propose that the pontoons not only migrate out to Seattle communities, but also provide an opportunity for them to come together as one. During this time, Seattle can unite as a diverse but singular entity. By merging all of the pontoons together at a central location in Lake Union, we’re essentially merging all of the communities into a floating quilt. See the full competition board here.